The feature plant in this article of our series on butterflies' favourite nectaring plants is the Chinese Violet. This tough widespread "weed" can be found in a number of habitats in Singapore, particularly in areas which have been cleared and awaiting development, or left to remain wild. It can be found growing in unkempt gardens to secondary forested areas to back-mangroves, usually as a low ground cover. 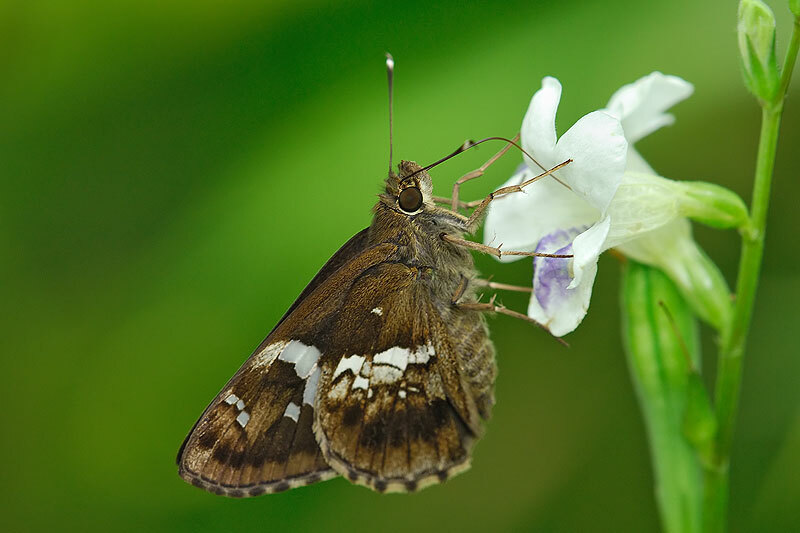 The Chinese Violet is a member of the family Acanthaceae, which features many butterfly host plants amongst the 2,500+ species in the family. 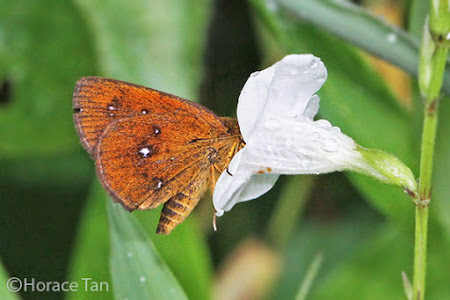 The Chinese Violet is no exception, being a host plant for several Nymphalidae species like the Autumn Leaf, Blue Pansy and Great/Jacintha Eggfly. 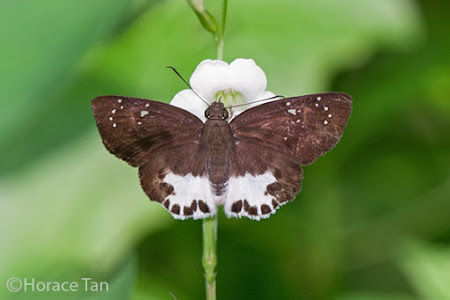 This species originated from sub-Saharan Africa, but has become naturalised in Asian countries like Singapore, where it grows rapidly in the hot humid climate. This herbaceous plant spreads quickly and is able to climb vertically up to 1m or more, if supported. 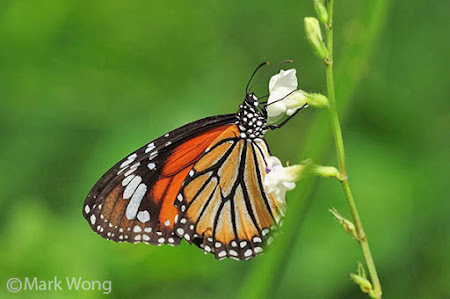 It does not appear to be particularly fussy about its substrate soils, and can appear in relatively harsh environments all across Singapore, although it prefers semi-shaded conditions to grow best. It roots easily when its stems and nodes come into contact with moist soil. 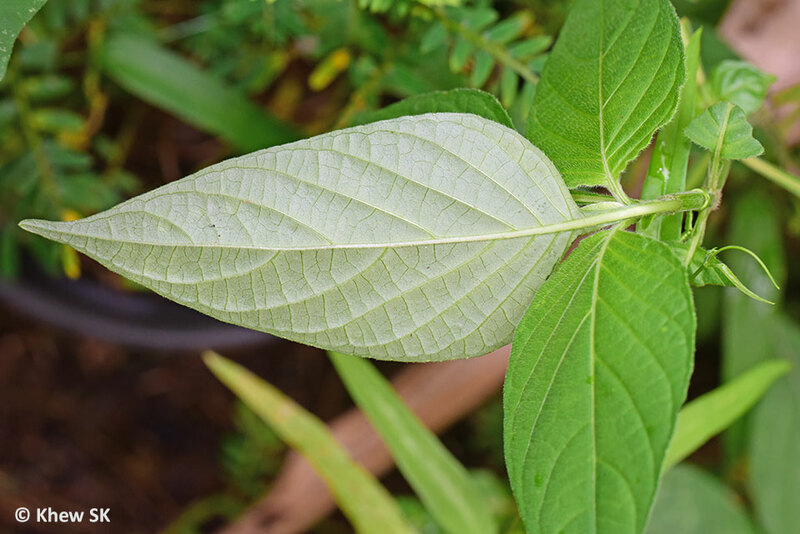 Cuttings sprout white roots within 3-4 days if left in water, and the plant can easily be propagated this way. The green leaves are simple, opposite and decussate (successive pairs of opposite leaves occur at right angle to each other). Each leaf is ovate or heart-shaped, sparsely hairy, smooth-edged and ranges between 3 to 7.5cm long. 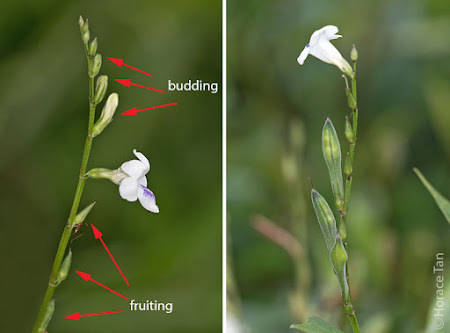 The plant grows upright on squarish stems that have ribs and short hook-like hairs. 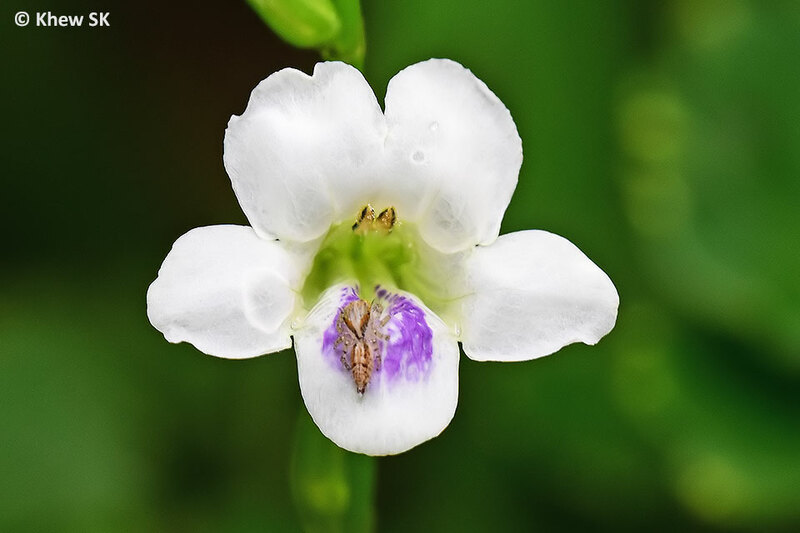 The flowers are in small, one-sided racemes at the stem tips, with the flowers at the bottom of the raceme opening first. Flowers of the Chinese Violet are small and tubular, each up to 3.5cm long. There are usually 6 to 10 flowers borne on each raceme. The calyx has 5 rounded lobes, purple, vein-ridged markings on the lower lip, and 4 stamens. This species is free-flowering throughout the year. These bisexual flowers attract insects including various species of butterflies to act as pollinators in the reproduction process. 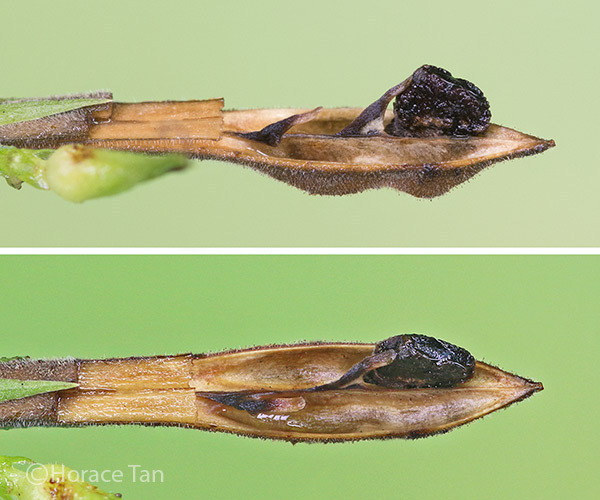 Explosively dehiscent fruits, which come in club-shaped capsules, are initially green, but becomes brown and dry after dehiscence (3.6 cm long). The fruit resembles an upside down cello and contains 4 whitish to brownish black, circular seeds which are flattened and beaked (5 mm long, 1 mm thick). 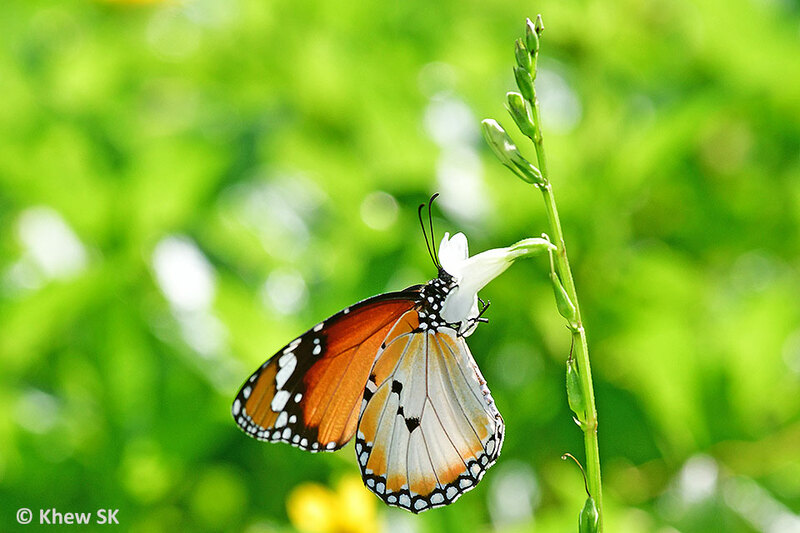 Fruits contain 3 mm-long hooks which help to propel the seeds further away from the plant during explosive dehiscence. 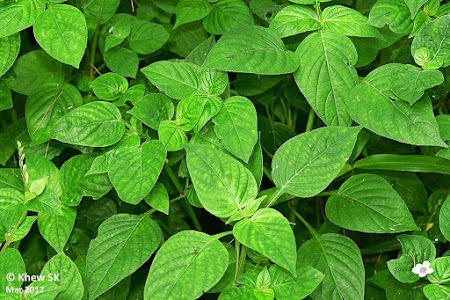 In some parts of Africa, the leaves are eaten as a vegetable and used as an herbal remedy in traditional African medicine. 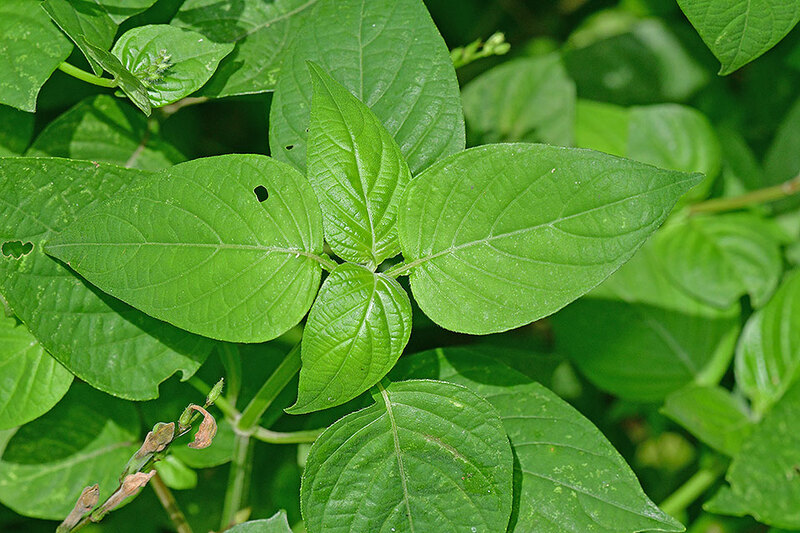 The leaves are used in many parts of Nigeria as a traditional African medicine for the management of asthma. 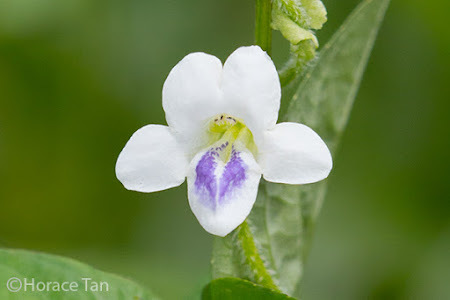 In Australia, this species is considered invasive and a serious threat to native ecosystems, and sightings of the Chinese Violet have to be reported to the authorities. 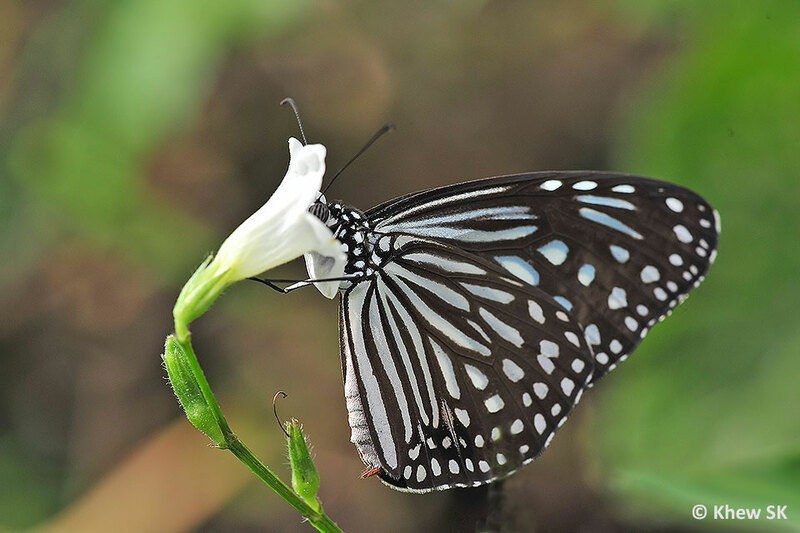 Besides being host plant to several butterfly species, the white/violet flowers of the Chinese Violet is rather attractive to the adult butterflies. The 'universality' of the flower of this plant to butterflies is interesting, as we have seen species from 5 out of the 6 butterfly families feeding on it. 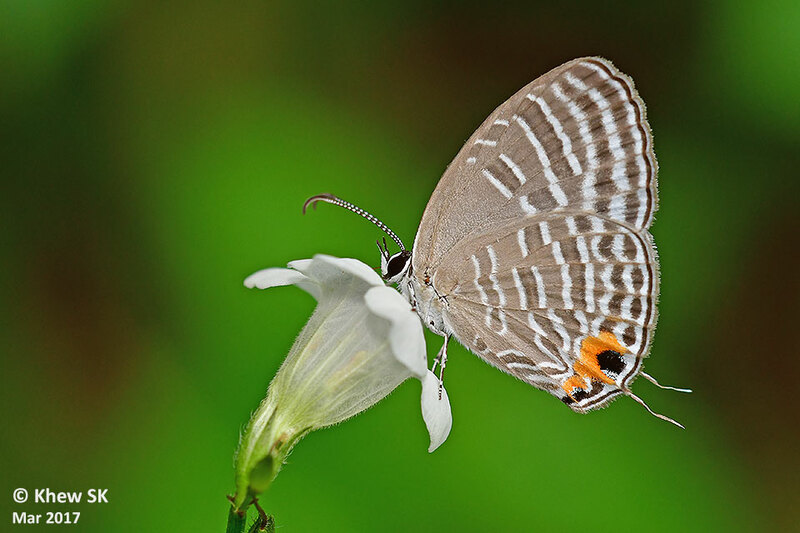 With the exception of Riodinidae, representative species from Papilionidae, Pieridae, Nymphalidae, Lycaenidae and Hesperiidae have been regularly observed sipping nectar from the flowers of the Chinese Violet. 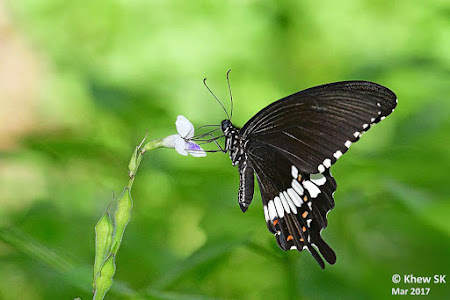 Of the Papilionidae, we have seen these larger swallowtails fluttering at the white/violet flowers of the Chinese Violet with their long proboscis extended deep into the flower. 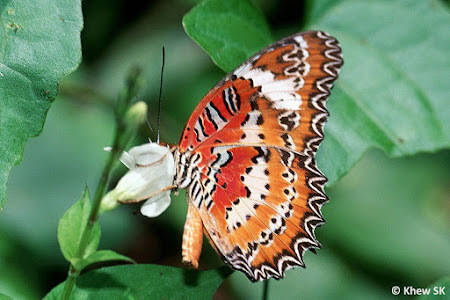 Species observed are the Common Mormon, Lime Butterfly, Common Mime, and even a Blue Helen, although it is often difficult to photograph these species moving rapidly from flower to flower with their forewings constantly flapping in the usual Papilionidae fashion. The Grass Yellows feeding on the flower of the Chinese Violet. 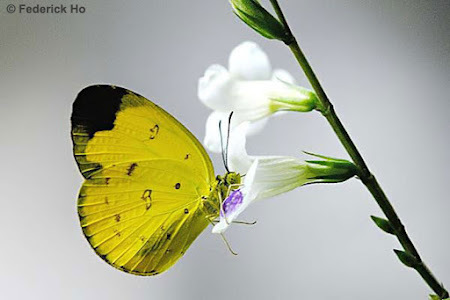 Note how they have to poke their heads deep into the flower to get at the nectar within the flower. 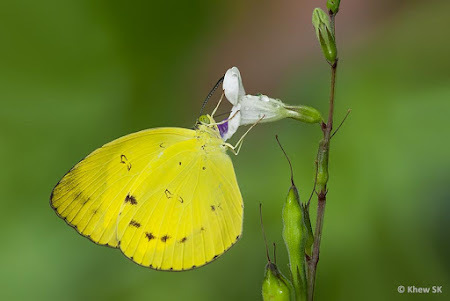 Amongst the Pieridae, the Grass Yellows (Eurema spp.) are most often seen stopping and pushing their heads deep into the flower of the Chinese Violet. 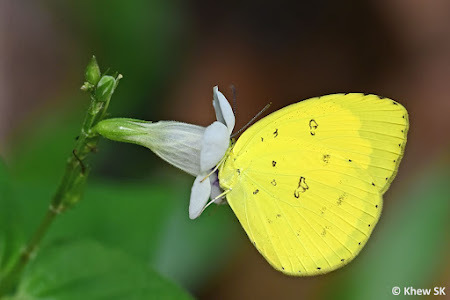 Perhaps the shorter proboscis of the smaller Grass Yellows cannot extend far enough into the flower to reach the nectar, so they need to push their heads further in to get at their liquid diet. 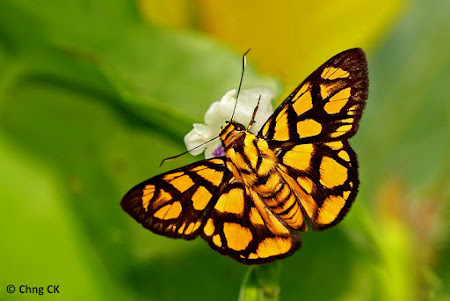 The large Danainaes and Nymphalinaes from the family Nymphalidae are quite regularly spotted to feed on the nectar from the Chinese Violet flowers. 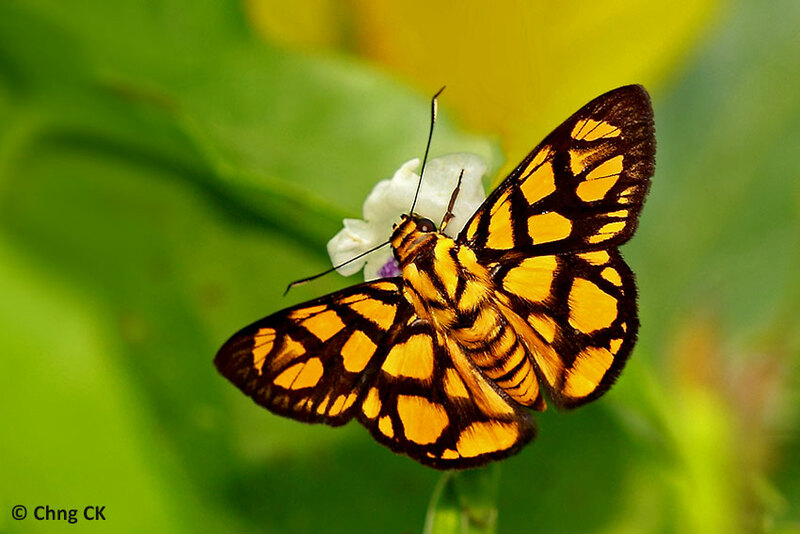 As with the Pieridae, even these larger butterflies are observed to push their heads deep into the flower (often giving a "headless" butterfly shot) when their heads are out of sight whilst they feed at the flower. 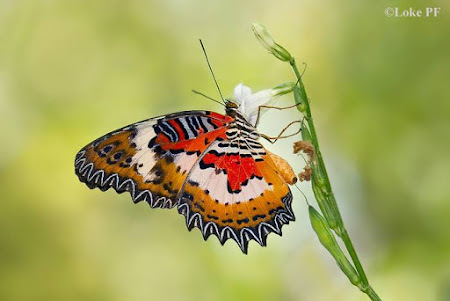 Species featured here include the Common Tiger, Dark Glassy Tiger, Plain Lacewing and Malay Lacewing are some examples of the Nymphalidae that feed on the Chinese Violet flowers. 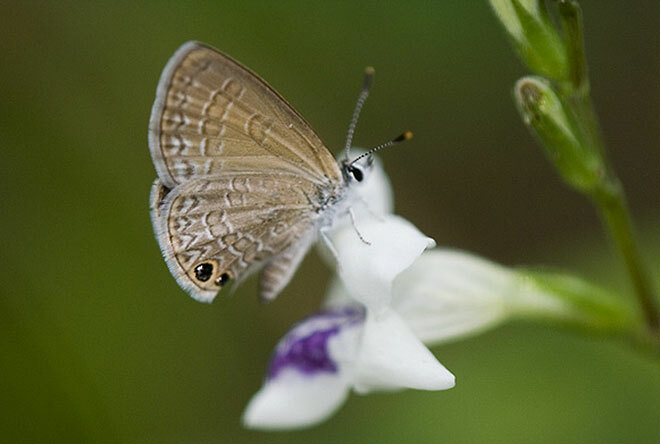 The diminutive Lycaenidae are also attracted to the flower of the Chinese Violet. Being small butterflies with fine proboscis, the Lycaenidae also have to reach far into the flower to get at the nectar. 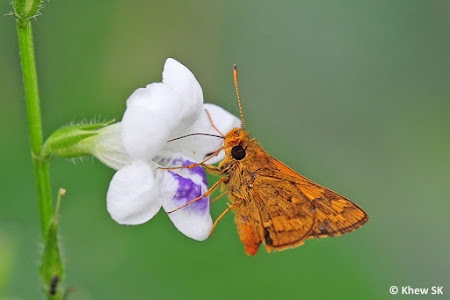 In the early morning hours, look for the Hesperiidae (Skippers) zipping amongst the low bushes of the Chinese Violet, reaching far into the flower with their long proboscis to feed on the nectar. 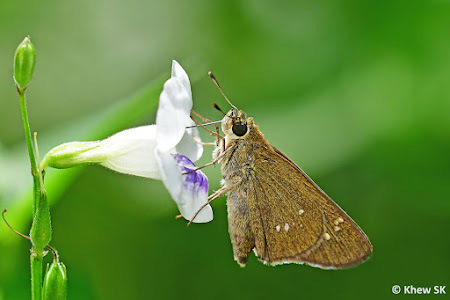 From the photo records of ButterflyCircle members, it appears that a larger number of different species of Hesperiidae have been observed feeding on the flower of the Chinese Violet than any other family. 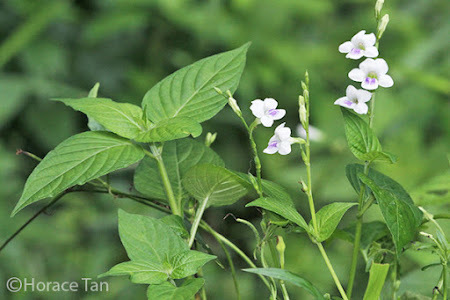 Despite being an unwanted weed found in wastelands, unkempt patches of greenery and cleared patches of sites awaiting redevelopment, the Chinese Violet is a valuable plant that is used for sustenance by Singapore's butterflies. 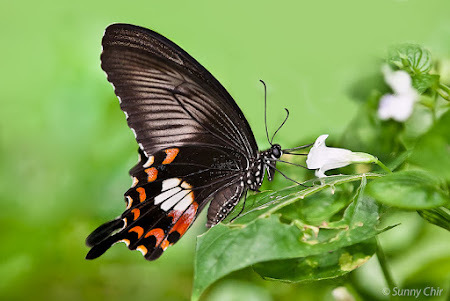 It is a caterpillar host plant for at least 3 species of butterflies, and a nectaring plant for a good variety of species of butterflies. So when you are out butterfly-watching, do keep a lookout for these 'white dots' amongst the low green shrubbery and ground cover - these are the pretty flowers of the Chinese Violet. Watch for the butterflies that feed on these white/violet flowers and add on to the list of species that you can see here, that use the Chinese Violet flower as a nectar source.